Updos are an easy way to bring some creativity and versatility to your look. 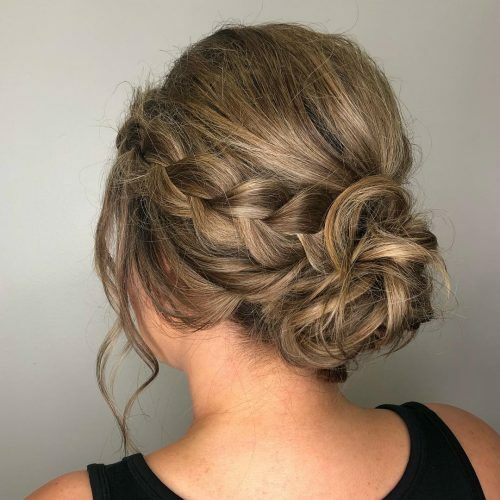 Whether you’re going to a wedding, headed out for a night out on the town, rocking out at a concert, or simply wanting to change things up a bit, give one of these eye-catching simple updos a try! 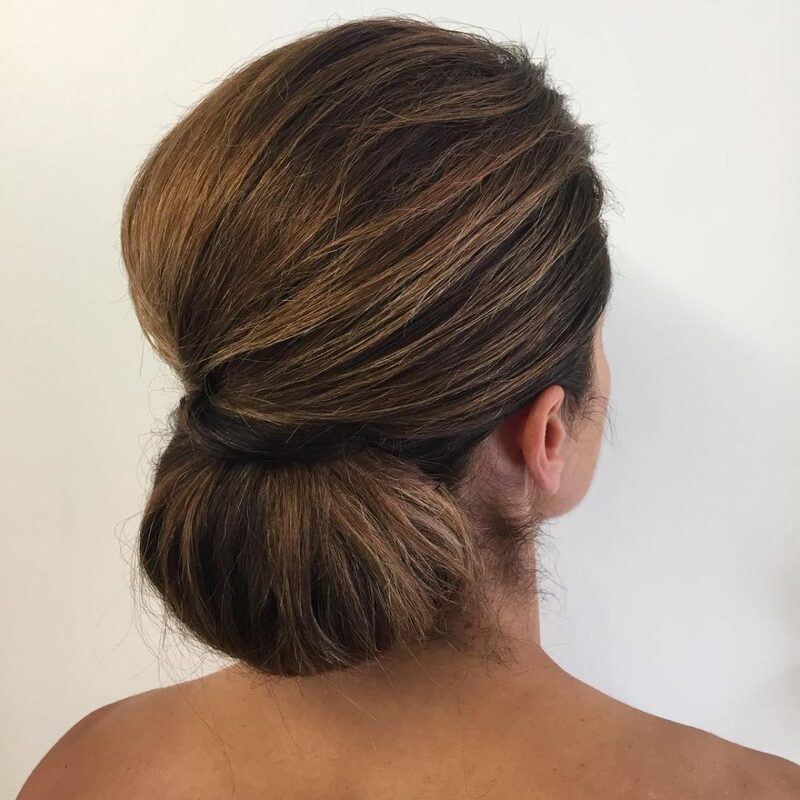 Tuck in those dimensional strands into a straightforward elegant bun! Gorgeous for any casual or red carpet event. This inside out weave ends into an exquisite twisted low bun that gives off a bohemian finish. Match with flowing lace-y dresses and you’re sure to receive endless compliments. 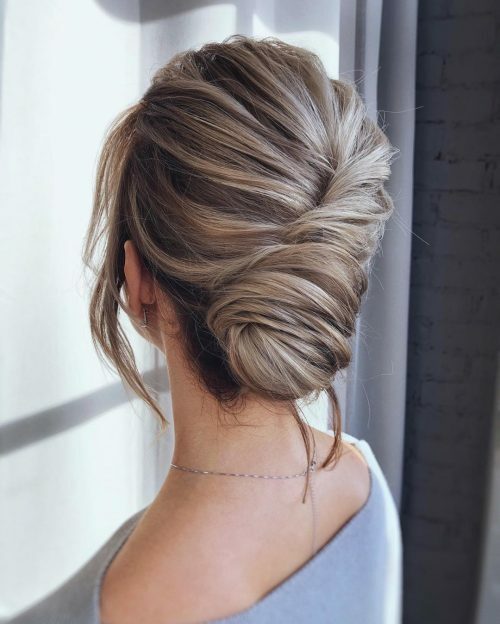 I love the simple updo look very much. Updo buns make the woman naturally younger and simply much elegant. Sometimes, you no need to wear any hair bands or flower but it still makes you attractive. To me, limit hair accessories are the best. Updo bun is quite suitable for those who want to look younger. You can wear it on any parties, prom, or birthday. It is also a good choice for brides. This look was meant to be effortless and flow harmoniously with the client’s hair. We wanted something that looked classy and polished without being super structured or detailed. 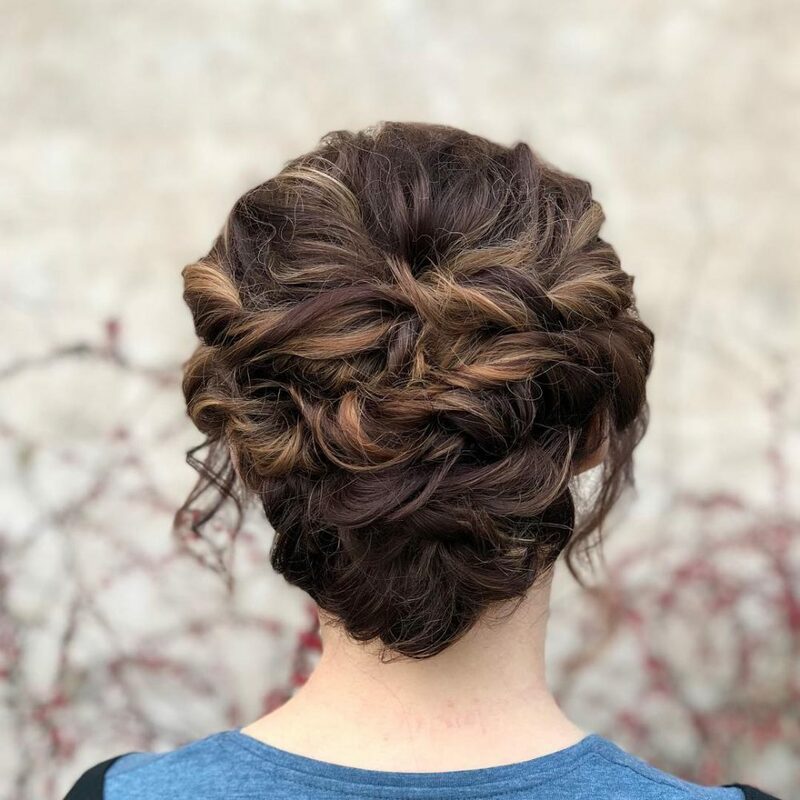 My favorite thing about this updo was that we were able to keep the style romantic and soft. Using her natural bangs, the front of the style just flowed naturally into the bun. This hairstyle would work for someone who wants a flowy, romantic, loose hairstyle. Or what people refer to as the “messy bun”. Someone who is looking for a classy elegant hairstyle that looks modern and creative. It works really well for clients who want their hair up and away from their face, without being a high, sleek updo. This effortless style can be achieved with most hair types and can also be enhanced by adding hair accessories or even braids. We just did some light teasing around the crown area and played around with how the hair would lay into the bun. It’s important to always work with the flow of the hair. This helps keep the hair looking organic and effortless. 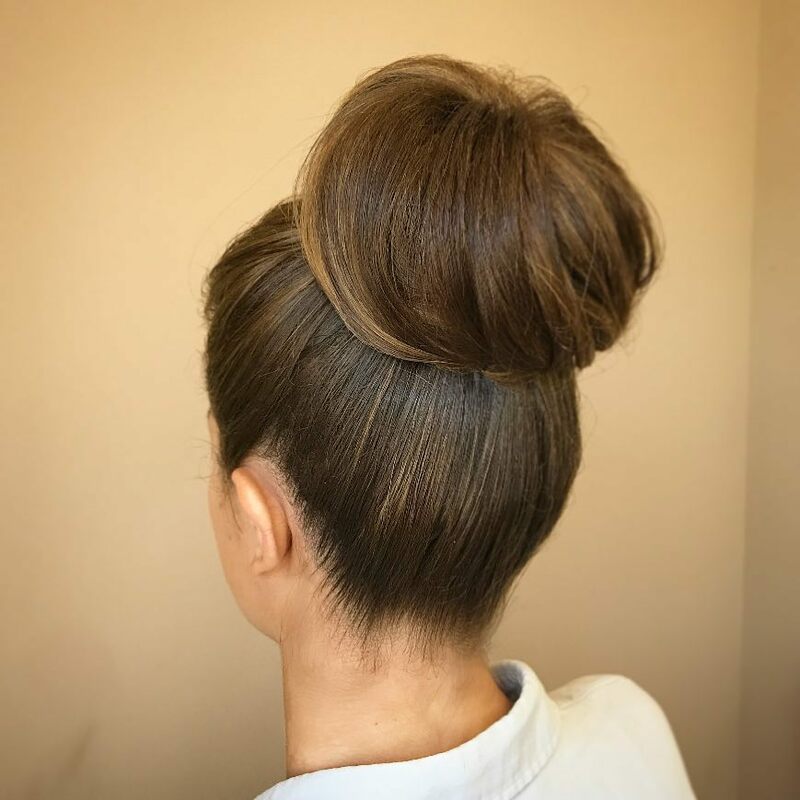 Pinned the bun in place and added a mist of medium hold hairspray to tame any loose hairs. This style is really simple and easy and can be worn for any occasion. 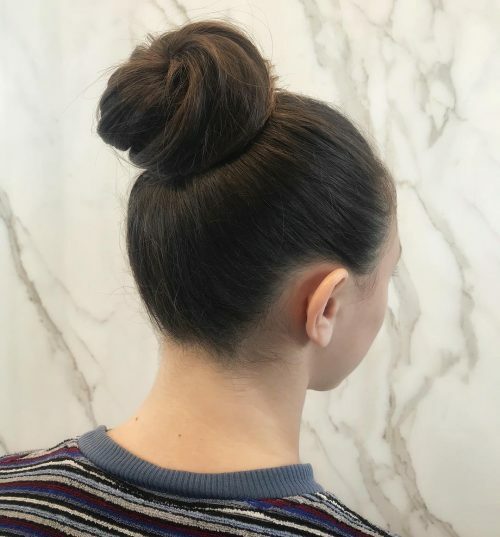 This is a soft, elegant, high-top, big bun. To achieve this style you will want to make sure you have a body-building spray for added volume and hold. The perfect product to use is Texture Wave from Shu Uemura. Spray all over on dry hair before securing into a high ponytail. Back-brush the ponytail and softly twist around the base of the elastic band and pin into place. Spray Sheer Lacquer from Shu Uemura to hold into place. This style is a soft, sweet hairstyle that is perfect for work or a night out with your girlfriends. This is the love child of a knot and a chignon. I love the simplicity of the overall look combined with the detail in the back. I like the stray flyaways that go out from the knot. The flyaways give the hair such a soft, natural, real feel. This hairstyle is great for someone who likes a softer, more natural look but also likes a little bit of extra detail. It’s perfect for just about anything ranging from a daytime event, a night out, a wedding – for a bridesmaid, or even for a bride! It’s so versatile! With a few tweaks here and there, it can be customized for all hair types, textures, and personalities. 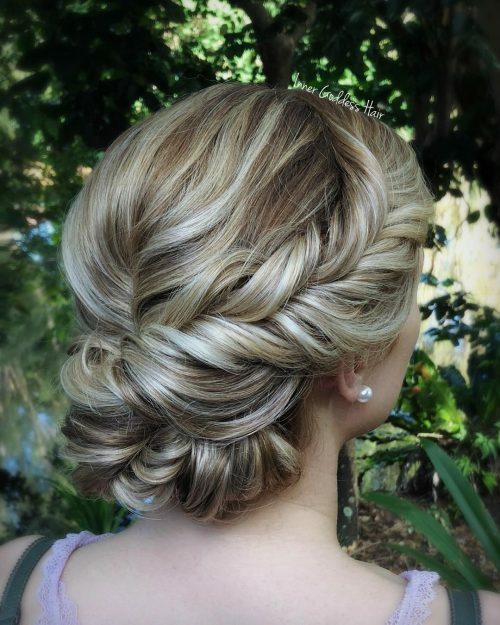 You’ll definitely turn heads with this beautiful updo! This is a messy yet simple style. This particular client had very fine hair and wanted the illusion that she had a lot of hair. She was very laid back and fun, yet had that “preppy clean look about her.” She also wanted it to be not so slicked and defined. I love how this look hides the shortness of her hair! If you do not have a lot of hair, find a stylist who works well with baby fine hair. It’s all in the teasing and twisting! Also, use a lot of dry shampoo. That helps to add texture and grit to the hair. 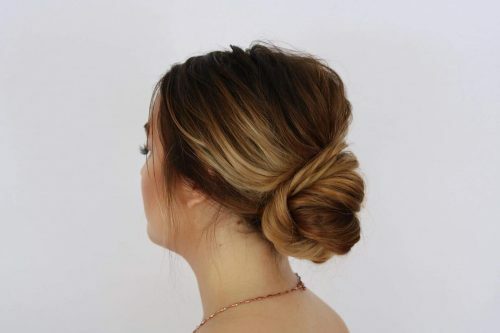 I’ve been seeing variations of these romantic low buns all over the internet lately, and I love them! I love how soft and classic they are. This one, in particular, is simple yet beautiful and would be perfect for a classic bride look or for any bridesmaid. It would be great for a date night too! I love that it can be achieved with almost any hair type and will flatter most face shapes. This is a timeless look that will not go out of style, which makes it great for a wedding. For the most beautiful finish, you’ll want to curl the hair first, give a light tease to the roots, and make sure it’s smooth. If you don’t have a lot of time, then you can do this with straight hair too. However, if you have thin hair you’ll want to make sure there is a lot of volume and texture added before starting the updo. Once you’ve added volume, you can start to twist and pin the back. Keep the face shape in mind because you will want to add volume in different places and amounts depending on the shape of your face. Then tease the hair that is not pinned, smooth it out, and twist and roll it up into a nice bun. Pin it in place and you’re done! Make sure to lock it in with enough pins and hairspray so it will last all day! This is a simple updo that can be done for any occasion when you just want your hair out of your face. It could also be great for a romantic dinner or special occasions if you add a few accessories. My favorite thing about this updo is you can easily do it by yourself in 5 to 10 minutes. 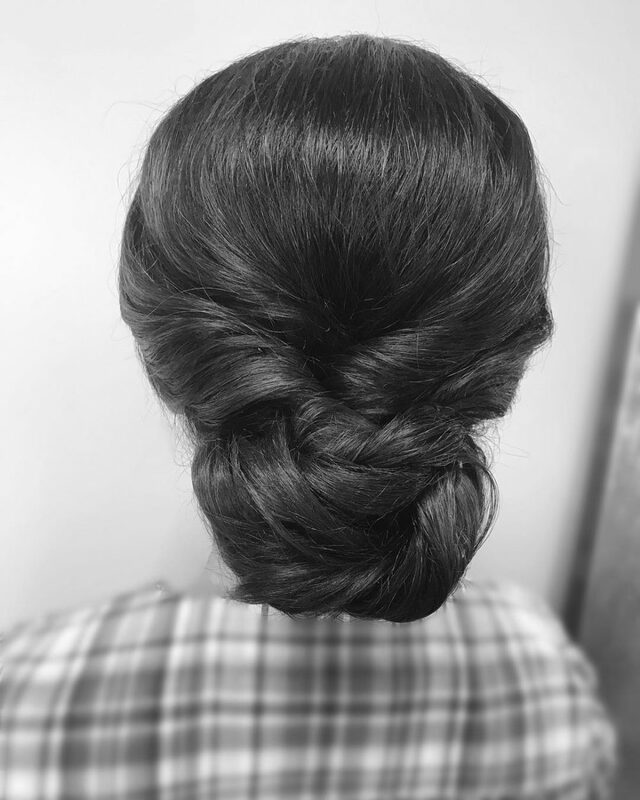 I would say this updo is best for a client who has second-day hair to give it more dimension. To make it look really romantic, pull some soft pieces out on the sides. If you have fine hair, second-day hair is best. Unless you use some hairspray to make it more textured for some dimension. If done on second-day hair, hairspray won’t be needed. It could be done on any hair textures and hair types. It’s best suited for short to medium hair length. This is a simple and yet stunning updo. My favorite thing about it is how fast it was to create this look, as updos don’t have to be complicated. I would suggest using second-day hair without washing so that it has a bit of texture and won’t get so frizzy when you pull it apart to make the updo more full. Dry shampoo is also highly recommended (I didn’t use any backcombing). 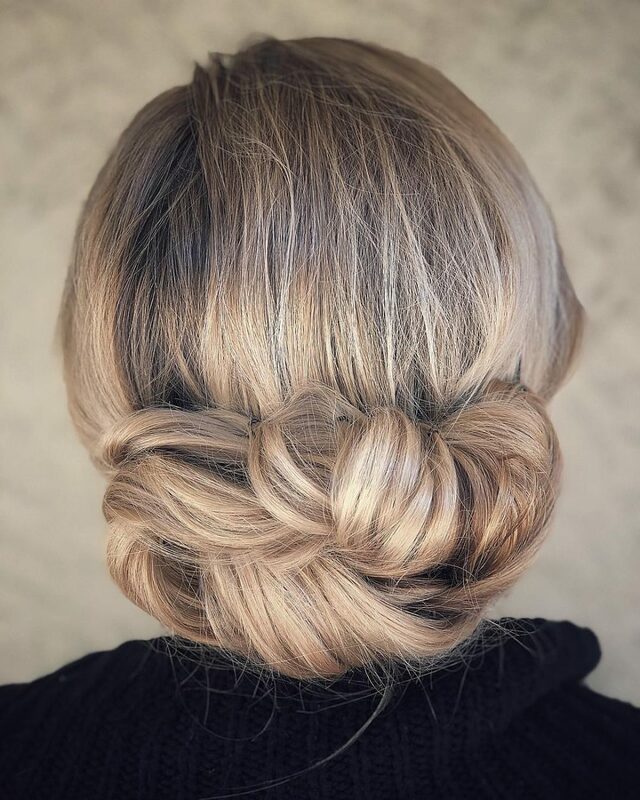 An effortless Twisted Updo! This look is very elegant and gives the hair volume and texture without looking messy. It’s perfect for bridal or special occasions like a classy or boho look. My favorite thing about this style would be that the curls you create are the foundation for the look. Medium to thick shoulder length hair is great for this style. Highlighted hair types will create amazing depth and movement. Brunettes can also rock this look. Using volume powder and medium hold hairspray work with the curls twisting in the direction they are falling in. Finish it with a gloss spray. To create the feature side twist, simply curl the bottom section over and the top section under, rolling them into the back so that they blend into each other to create a braid like look. This is simple and understated. It’s an elegant updo with beautiful undone feel to it. This style is for the girl who doesn’t like her hair to be too structured. I like to do a little backcombing at the crown to add a little height. I use a texturizing spray like Joico Hair Shake to add texture and grip to the twisted sections. 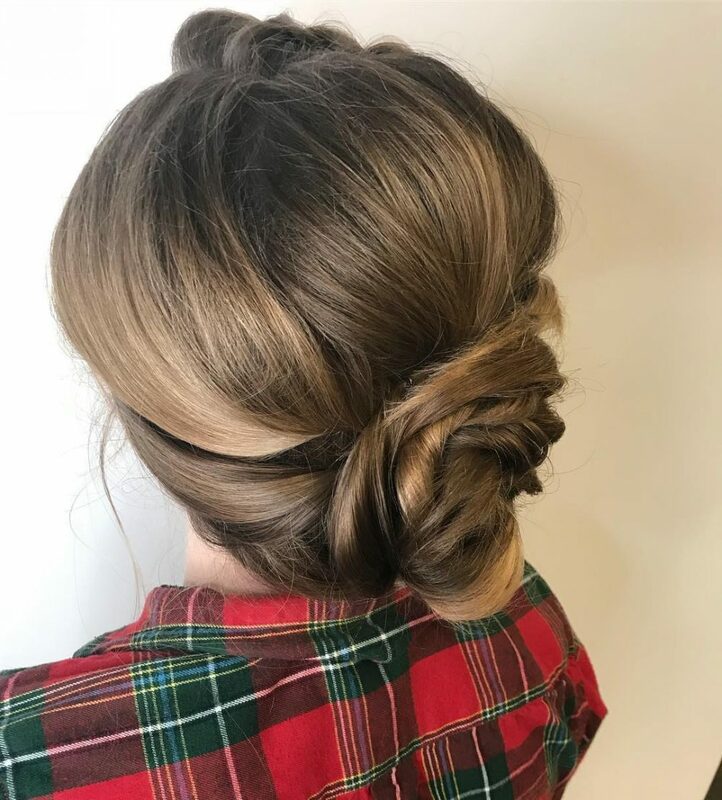 A little updo like this is a joy to create. This look is a simple, yet flirty style. 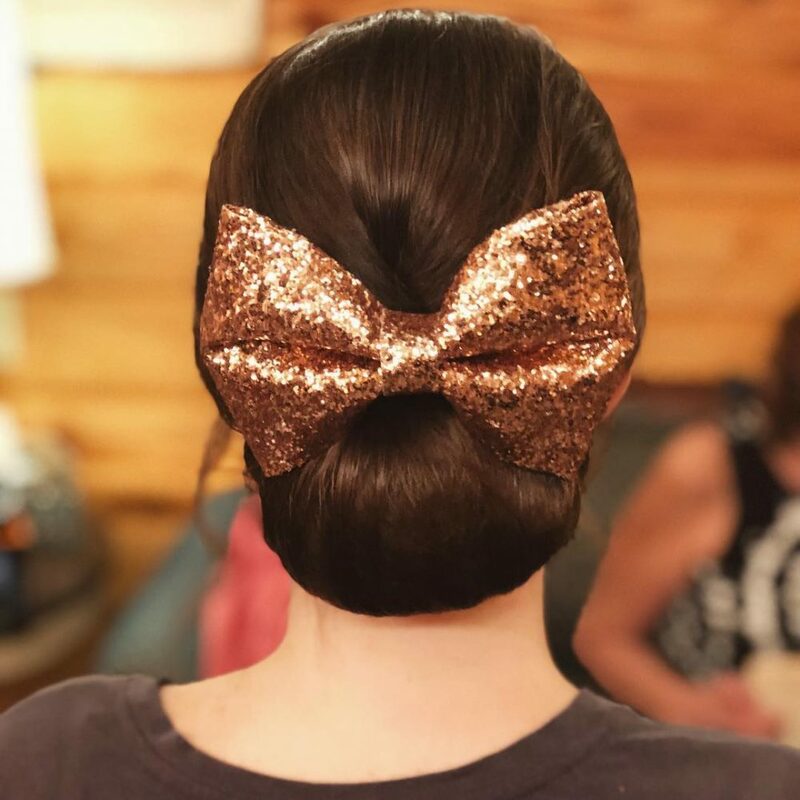 It shows the elegance of a classic bun, but the bow gives it that extra sass. This look is perfect for any wedding party member needing a little classy spice! I recommend starting with fresh, clean hair that is blow dried with the Bumble & bumble Thicken Up product line. Finish with Kenra’s High Def Spray and Firm Hold Hairspray to ensure the look will stay through the night! This is a hairstyle created with wavy hair. It looks light and elegant and can be worn for special occasions like going to the theatre or a classical concert. 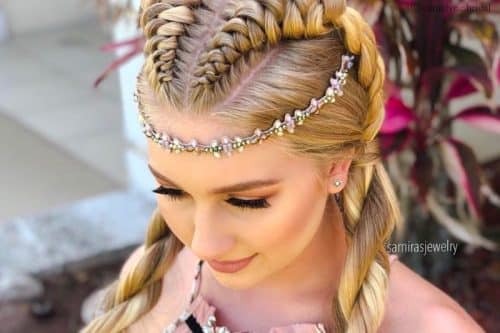 This hairstyle is also suitable for a wedding. Just add some fresh flowers or an elegant accessory and it will look even more beautiful. This hairstyle is easiest to create on women with at least medium length hair and looks best on blonde and brunette hair. My client was a young girl going to a social, so my inspiration was soft and feminine. She is a young girl and we wanted the hairstyle to stay true to that without going too “little girly”. My favorite part of this look is the braid. This client has very thick hair with a coarse texture, so it made for a great full braid. Start with curling or smoothing out the hair and some teasing around the crown. Always pull out your braids to make them appear fuller. I do this on every braid, even when the client has full textured hair. 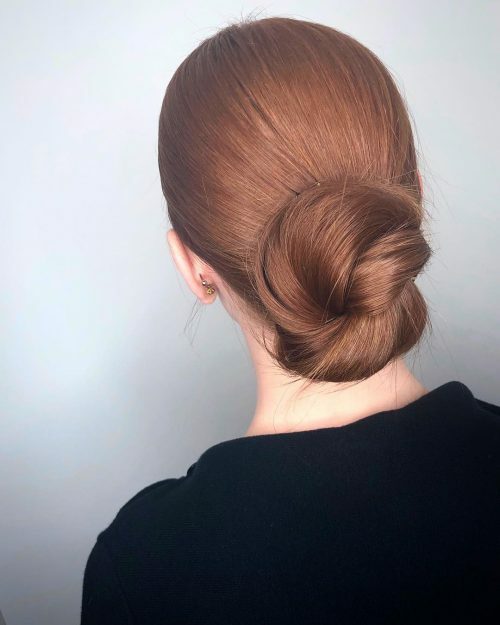 This look would be best described as the classic chignon or classic low bun. My favorite thing about this upstyle is that it’s elegant and effortless. It’s also simple to do. With just a few steps, you can achieve this timeless look! You need bobby pins, a hair donut, texturizing powder and a light hairspray. Mold the donnut into an oval shape before pinning it into the nape. Tease the roots from the crown all the way to the hairline for volume. Spray the updo, then dry the hairstyle with a diffuser to help set it. It won’t move after that! Any hair type will work with this look so long as it’s smoothed out before hand. It suits many face shapes like oval, diamond and heart, not so much round or square as there are no strands left out at the face to soften it. I’ve done this look on brides and women who are just going out to a fancy dinner. It’s definitely something that can be dressed up or down. It’s timeless! This look will even work on a corporate working class lady for a meeting. This is an elegant but simple look. It is very tough to create such a smooth style because not everyone’s hair has a perfect texture. As a stylist, you really need to know your stuff and prep the hair as much as you can first. My favorite thing is how smooth the hairline is and how full the bun is. There were a few tricks to this updo that you wouldn’t guess. I used about four to five rubber banded ponytails to get it as tight as I could. I love Oribe Dry Texturizing Spray to give it more stability. I also used a donut bun to help give it more fullness. I recommend this hairstyle for someone who wants a classic full upstyle with a smooth modern twist. You could literally do this style on any hair type. 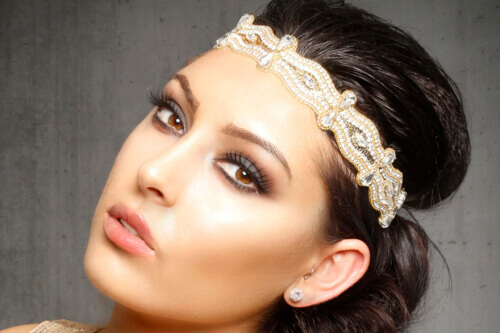 Hair pieces help with thinner, finer hair. I would describe this upstyle as classic yet romantic. It has the simplicity and softness to make it a timeless look. My favorite things about this style are the twisting sides and that anyone can wear it. With every upstyle like this, I always curl set the hair to achieve the most volume. As far as products go, I love to use Kenra Working Spray as I am doing the style because it doesn’t get tacky or too stiff. It gives me the hold I am looking for and also the flexibility to move pieces and still look soft. Another go-to is Oribe Shine Spray. I am obsessed! With any upstyle, using mette bobby pins makes a huge difference in hiding your pins. I recommend this for many different clients. This was done on a mother of the bride. It gave her the hair off the face she was looking for, but nothing too over done that would upstage the bride. It is still beautiful and classic. To achieve this look, I would definitely say that the client needs at least medium thickness and length. If they do not have this, using extensions is a great way to add both. Assess the front of the style to the clients needs so that it frames face and makes it soft and romantic throughout the look. If the person has a rounder face, maybe add some face framing, whispery pieces to add softness. I love this bohemian bun because it is so versatile. My favorite thing about it is that you can dress it up for a formal occasion, or dress it down for everyday wear. You can achieve this look in just a few minutes! This bun was created by making two pigtails with pulled apart braids that are pinned together. Make sure you zigzag the part so that you don’t see any lines when you comb it down into the bun. Definitely use a light hairspray! This look is great for any face shape and for anyone who wants to have a simple, effortless style.